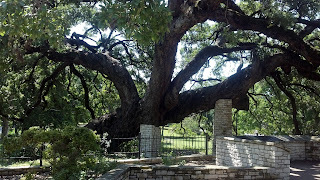 This is the Founder's Oak in New Braunfels, Texas. In 1700, a random squirrel buried an acorn and either promptly forgot about it or was eaten by a bobcat. That acorn did what acorns are supposed to do if they aren't eaten by squirrels; it became a tree. First it was a seedling. Then it became a sapling. And finally, it was a tree. People passed by the tree as it grew, and they could have cut it down for firewood or to build something. They did not. 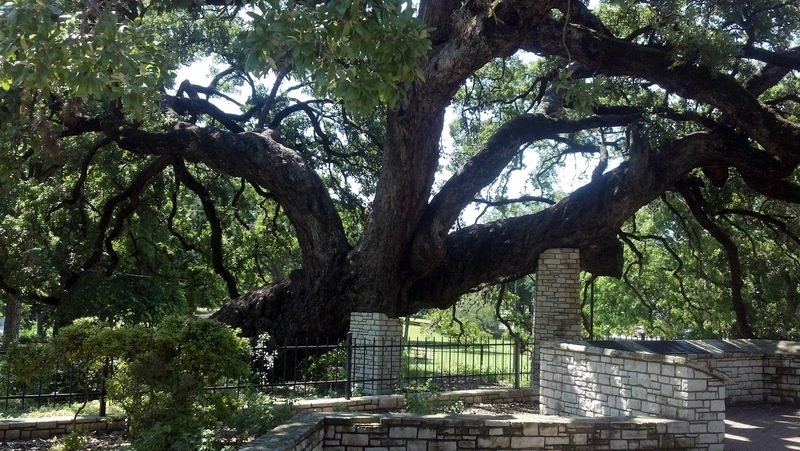 When the city of New Braunfels sprang into existence, this tree was there. Germans are all about practical, and the tree would have been useful, but nobody touched this tree. I am glad that they didn't! It's a majestic Live Oak tree, and even though it's had to be propped up, it's still going strong. i'm glad they keep it--stunning!